In a post last week we discussed NAHB research showing how during the first two years after closing on a home sale, home buyers tend to spend money on furnishings, appliances and remodeling considerably more compared to non-moving owners. Buyers of new homes spend most, outspending non-movers by a factor of 2.8. Buyers of existing homes spend twice as much as non-moving owners. This post reveals particular items that are most popular with home buyers and helps explain changes in their spending behavior triggered by a house purchase. The NAHB analysis of the Consumer Expenditure Survey (CES) data from the Bureau of Labor Statistics shows that the biggest outlay in the budget of new home buyers is furnishings. They spend $5,288 on furnishings during the first year after buying home, outspending buyers of existing homes 2.2 times and non-moving owners 5.3 times. Average spending is estimated for all households in the group regardless whether they purchased a certain item or not. Thus, higher averages may point to larger and/or more frequent spending by the group. The biggest ticket item for all home owners is bedroom furnishings, including mattresses. However, buyers of new homes spend twice as much on this item as existing home buyers and outspend non-moving owners six times. This is not surprising considering that the number of bedrooms in new single-family detached homes has been on the rise. The second largest furnishings outlay for home buyers is sofas. New home buyers spend on average $746 during the first year after moving, more than double of what existing home buyers spend, and more than six times the amount spent on sofas by non-moving owners. The differences are even larger when comparing spending on window coverings. 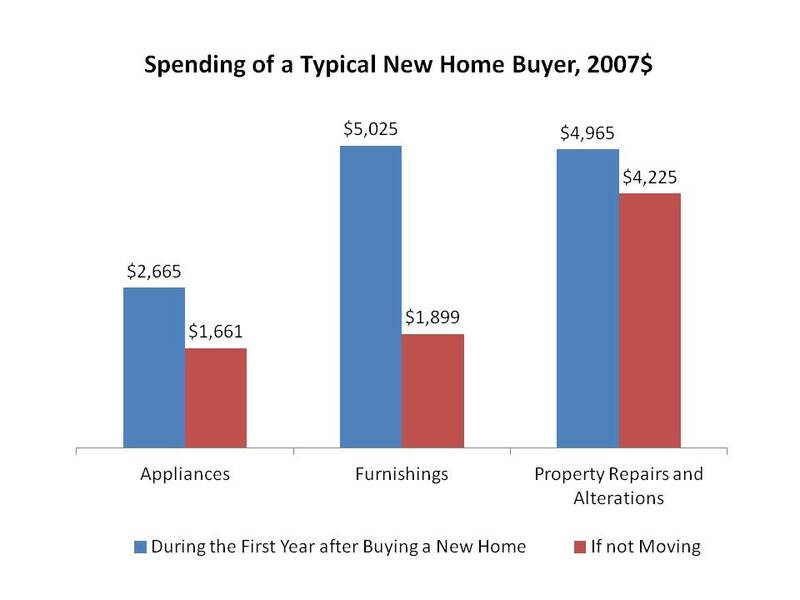 New homebuyers outspend existing home buyers 7.7 times and non-moving owners 24.7 times. New home buyers also outspend non-moving owners on every single appliance listed in the CES. They also tend to outspend existing home buyers across almost the entire range of appliances. The few exceptions include lawnmowers, gas stoves, built-in dishwashers, and some other miscellaneous appliances. 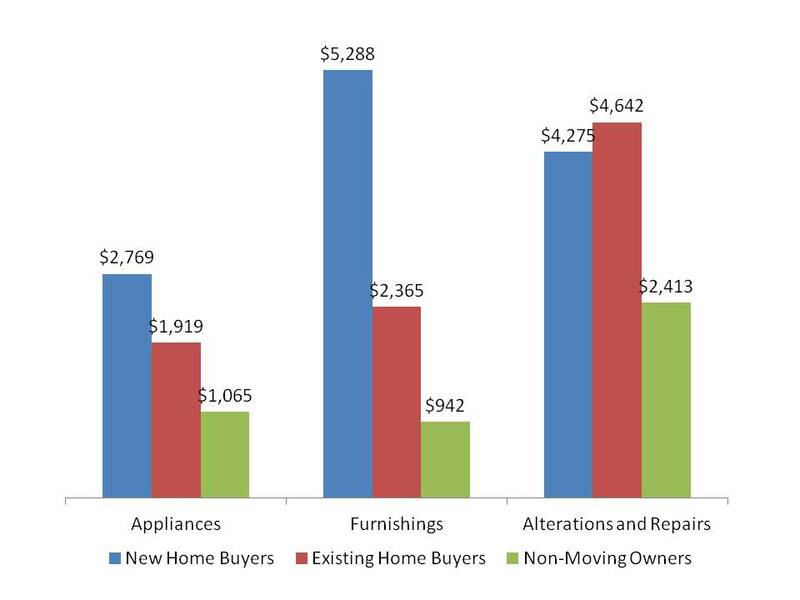 The high level of spending by new home buyers may seem surprising considering that many new homes come with installed appliances, but the data suggest that these purchases are nevertheless more frequent among these households. New home buyers spend the most on televisions, refrigerators, clothes washers/dryers, and computer systems – items that are less likely to be included in the purchase of a new home. The most expensive appliances in the budget of existing home owners are clothes washers/dryers, refrigerators, and lawnmowers. Somewhat surprising, new home buyers spend almost as much as buyers of existing homes and outspend non-moving owners on property alterations and repairs. However, the specific types of remodeling projects are quite different across the groups. 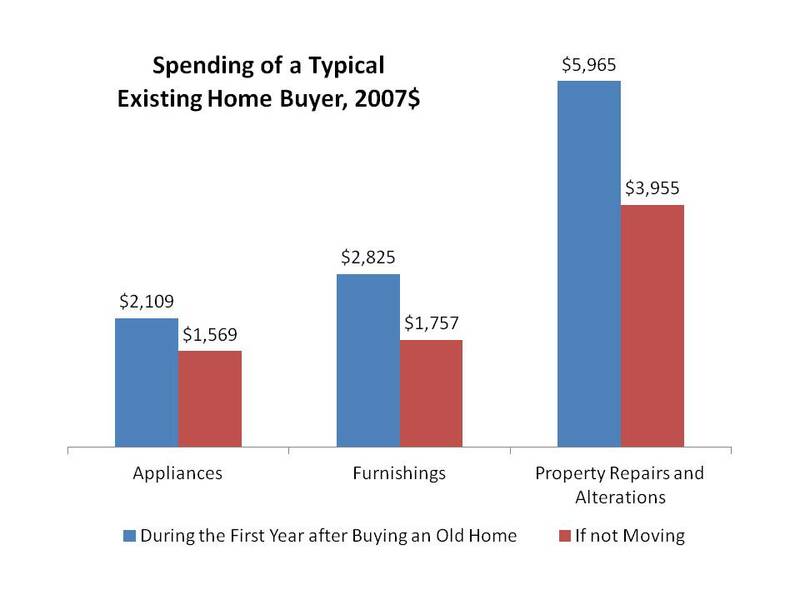 As expected, buyers of existing homes and non-moving owners spend more on various repairs and replacements. As a matter of fact, existing home buyers spend more than new home buyers on every single item the CES lists as a repair or replacement. They also outspend new home buyers on kitchen/bathroom addition or remodeling, and purchasing and installing new items such as HVAC, plumbing, electrical and security systems, paneling, flooring, siding, windows and doors. However, when it comes to outside additions and alterations, including additions of patios, terraces, new driveways, and fences, new home buyers outspend existing home buyers and non-moving owners by far. There are several items where non-moving owners outspend homebuyers, including addition of detached garage, repairs of driveway/walk, siding/roofing, replacements and repairs of doors and windows. The NAHB analysis compares spending behavior among three groups of single-family detached home owners: buyers of new homes, buyers of existing homes and non-moving owners. During the first two years after closing on the house home buyers tend to spend on appliances, furnishings and property alterations considerably more compared to non-moving owners. However, home buyers tend to be larger households with children, and on average wealthier, with higher levels of education and concentrated in urban areas. Any of these factors could potentially explain higher spending on appliances, furnishings and remodeling by home buyers. Thus, the NAHB analysis controls for the impact of household characteristics on expenditures, and, nevertheless, finds that a home purchase alters the spending behavior of homeowners and that otherwise similar homeowners spend more across all three categories compared to non-moving owners during the first two years after moving. Buying an older home also triggers additional spending. The typical buyer of an existing home tends to spend close to $4,000 more on remodeling, furnishings, and appliances compared to otherwise identical homeowners that do not move. However, in case of buying an older home, most of this extra spending goes to remodeling projects, more than $2,000, and occurs during the first year after closing on the house. Only the additional spending on furnishings tends to persist beyond the first year. Total private residential construction spending increased to a seasonally adjusted annual rate of $328.6 billion in May 2013, the fastest pace of residential construction since October 2008. The reading is 1.2 percent above the positively revised April estimate and 22 percent higher since a year ago. 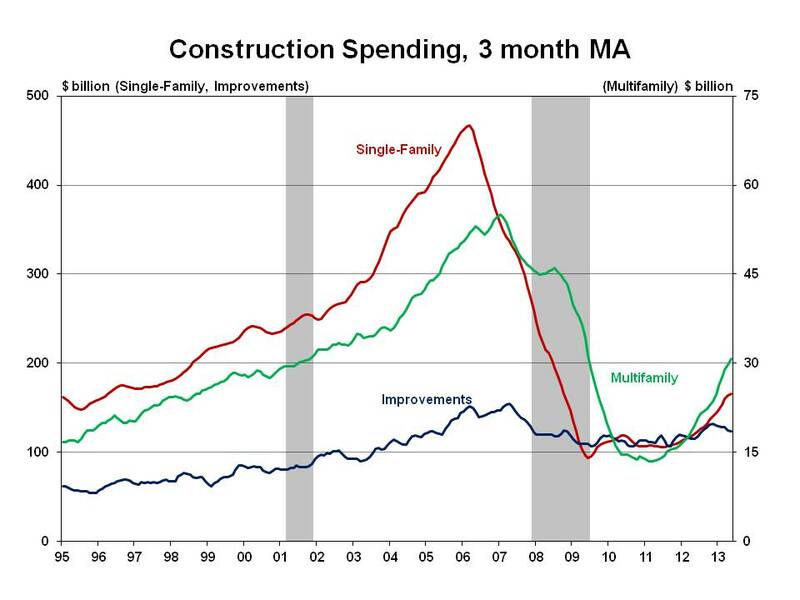 All three components of residential construction spending registered gains. 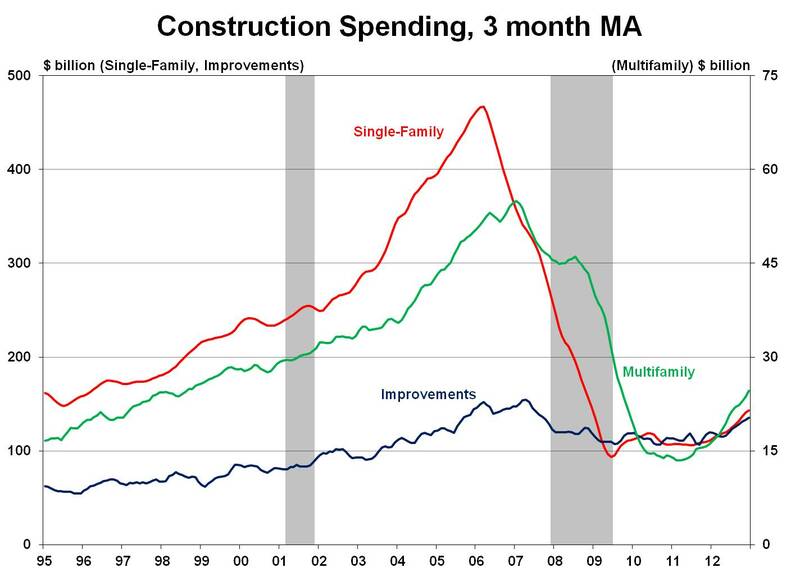 New multifamily construction spending showed the largest increases, rising 2.5 percent since April and 51.7 percent since May 2012. It is now at a seasonally adjusted annual rate of 31.8 billion. Spending on new single-family homes increased to an annual rate of $166.3 billion, the rate unseen since August 2008. 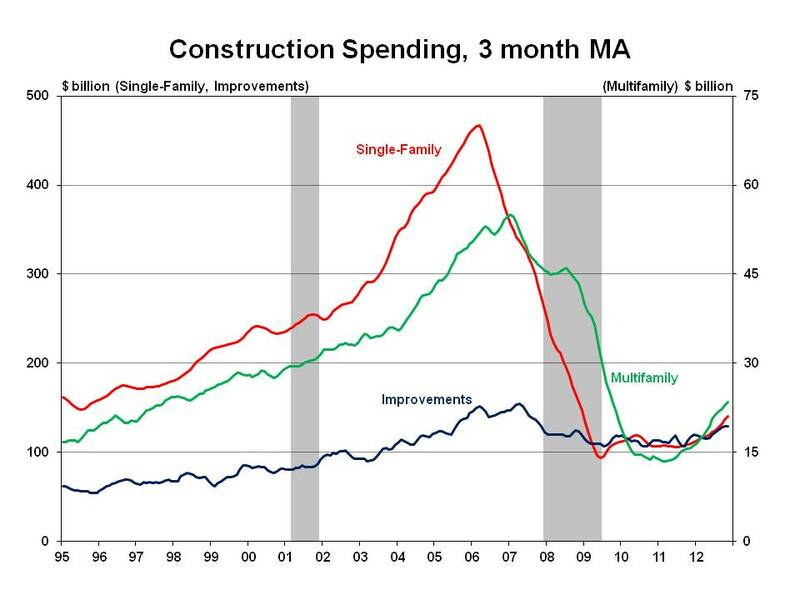 On a year-over-year basis, new single-family construction spending increased 33.2 percent. Finally breaking the decline that started in January 2013, home improvement spending also registered gains. Remodeling spending increased to an annual rate of $124.2 billion, 1.9 percent above the April reading, 7 percent above the year ago, but still below the spending rate registered during the first quarter of 2012. To celebrate National Home Remodeling Month in May, the National Association of Home Builders (NAHB) Remodelers recommends that home owners consider the safety risks, time delays and hidden costs before attempting do-it-yourself (DIY) home improvements. According to the 2011 American Housing Survey (AHS) from the HUD/Census Bureau, home owner do-it-yourself (DIY) projects accounted for 37 percent of all home remodeling projects performed nationwide from 2010-2011 but only 18 percent of all remodeling spending. DIY home improvement projects tend to be smaller, require less technical training and expertise and cost less, with 50 percent of home owners spending less than $950 on these projects. At the same time the median spending on professional remodeling projects is close to $4,000. One of the most expensive remodeling projects is a kitchen addition, with half of these projects costing more than $27,000. Very few homeowners attempt or manage to add a kitchen on their own. The AHS data show that more than 80 percent of kitchen additions are done professionally. Replacing roofing is also largely outsourced to professional remodelers, 82 percent of these projects are completed by professionals. Home owners also tend to hire professionals when it comes to home improvement projects that require technical training and, often, a professional license. Close to 90 percent of all remodeling projects that involve adding or replacing HVAC system are done professionally. Almost two thirds of projects that replace internal water pipes, electrical system, major equipment and appliances are completed by professionals. Not only that home owners might not have the right tools and knowledge to complete these projects, but many warranties become void by improper installation. Home owners are more adventurous and successful in finishing smaller projects. About half of all plumbing fixtures replacements are completed with no professional help. More than half of all bedroom and recreation room renovations are completed by home owners as well. These tend to be smaller projects, with half of them costing less than $1,500 and $1,600, respectively. Professional bedroom and recreation room renovations are bigger in scope with median spending of $5,000 and close to $7,000, respectively. Spending on private residential construction activity ticked 0.4% higher on a month-to-month basis during November 2012. October’s preliminary reading of a 3% gain was bumped down to a 1.3% increase, but at the same time the initial estimate for September was pushed upward from 1.1% to 2.9%. Spending has increased in each of the last 8 months (and 15 of the last 16), rising to a 4-year high and nearly 33% above the trough during the third quarter of 2010. New single-family home construction led the way in terms of spending growth among the private residential categories during November, posting a 1.3% increase versus October. Spending has climbed more than 29% above its nominal level of a year ago and stands 57% higher compared to the trough in mid-2009. A softer reading on single-family housing starts might point to some potential weakness in spending on this category going forward, but a 2-point increase in NAHB’s HMI and another strong reading on permit authorizations point to stronger construction activity (and by extension spending) over the near term. The multifamily construction sector registered its slowest rate of month-to-month growth in nearly a year, but November’s 0.5% still marked the 14th month in a row spending activity has increased. In the past year, nominal spending on multifamily projects has jumped 46% and stands nearly 83% higher than the low posted in August 2010. Starts of multifamily dwellings have averaged over 250,000 units for the past six months and approached 300,000 during the past two months. The current forecast calls for a modest slowdown in starts during the first quarter that will likely be followed by gains through the end of 2014–a pattern that can be expected for construction spending in this sector. Spending on home improvements dipped 0.7% in November, adding to the 1.9% contraction (revised downward from a 1.8% gain) reported for October. Expressed as a 3-month average (so as to smooth out monthly volatility), nominal spending on remodeling activity has hovered around a 5-year high for the past few months. NAHB’s Remodeling Market Index (RMI) has pointed to an even stronger assessment of current market conditions by professional remodelers as the RMI reached 50 for the first time since 2005. Our forecast calls for steady gains in remodeling activity through the end of 2014. Private residential construction spending surged 3% on a month-to-month basis in October 2012. The initial estimate for September was revised downward from a 2.8% gain down to a 1.1% rate of growth; however, this was more than offset by an upward bump in the previously reported estimate for August from 1.2% to 2.8%. Following increases in 14 of the last 15 months, nominal spending on private residential construction activity is at its highest dollar value since late 2008. In addition, spending has risen 32% above the trough registered during the third quarter of 2010. New single-family homes continued to post solid rates of growth, increasing 3.6% on a month-to-month basis for the second month in a row. Spending is also 29% above its year-ago level and has climbed 55% since bottoming out in mid-2009. This latest print on construction spending merely confirms the firming recovery for new single-family home construction that has been observed via housing starts and the HMI. With permit authorizations climbing rapidly and hitting their highest levels since the summer months of 2008, we anticipate this robust pace of growth in construction activity to continue over the near term. The positive momentum continued for the multifamily sector, notching its 13th consecutive monthly increase with a 6.2% gain over September 2012. Overall, the dollar value of multifamily construction activity has surged more than 82% from its cyclical low observed just two years ago, due in part to strong growth in renter demand. Multifamily starts have averaged better than 230,000 units over the duration of 2012 and given that permits have averaged approximately 280,000 units during the same time period, multifamily construction spending will likely rise further in the coming months. Home improvement activity expanded 1.8% during October 2012, offsetting the downward revision of a 1.2% decline posted for September. Using the 3-month moving average to iron out some of the volatility in this metric, nominal remodeling spending has reached its highest point in five years. NAHB’s own Remodeling Market Index (RMI) has pointed to an even stronger assessment of current market conditions by professional remodelers as the RMI reached 50 for the first time since 2005.